Date: Jun 22 2019, 5 p.m. 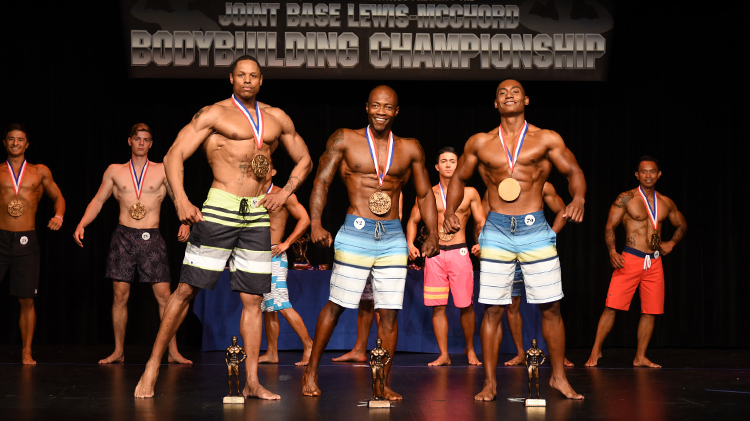 Enter the 2019 Bodybuilding Championship for Service members and civilians! This year we will be featuring special guest poser, IFBB Pro Michael Spencer. Awards: Trophies will be awarded to the top three finishers in each division. Overall winners' trophies and best poser plaques will be awarded to the top male and top female contestants. Contestant Information: All contestants must participate in both prejudging and the evening show at Nelson Recreation Center. Music: Contestants will not be permitted to use the music during prejudging. Music for the evening show must be provided by contestants on their own CD (labeled with your full name). CDs must be submitted at check-in time. Each competitor will have 60 seconds during the evening show, therefore, your music must be 60 seconds long. If the technicians find your music is not suitable for broadcasting over the sound system, you will have to pose to house music. It is your responsibility to ensure your music is correct. Mandatory Poses: Mandatory poses will include front double bicep, front lat spread, side chest (your choice of side), back double bicep, back lat spread, side tricep (your choice of side), women's leg back, front abdominal with leg extended forward arm overhead. Women's poses will include front and back spreads and no bend-over hamstring poses. Be prepared to do comparisons after the third round. Notes: The following items will not be permitted during prejudging with the exception for women's figure: props, hair ornaments, bows, bands or jewelry (with exception of a wedding ring). Suits must be in good taste and a solid non-metallic material. Registration deadline is June 4, link below. For more information call +1(253)477-4204.